Mar 1-3 Lake Flaccid Winter Olympdicks Hosted by the Snowblinders H3 in Cleveland, NY, USA. Mar 1-3 Colorado Skash Hosted by the Colorado Road Whores H3 in Steamboat Springs, CO, USA. Mar 7-10 Hash Bash Hosted by Wild Wolf in Palawan, Philippines. Mar 15-17 Ides of March Hosted by the Rome H3 in Rome, Italy. Mar 15-17 SLuTty Hot Tub Time Machine Ski Weekend IV Hosted by the South Lake Tahoe H3 in South Lake Tahoe, CA, USA. Mar 15-17 3rd Annual Green Dress Run Hosted by the Little Rock H3 in Eureka Springs, AR, USA. Mar 15-17 Green Dress Run Hosted by the Whoreman H3 in West Wendover, NV, USA. Mar 16-18 1000th Run Hosted by the Dili H3 in Dili, Timor-Leste. Mar 22-24 30th Anniversary & Skihash Hosted by the Oslo H3 in Sjusjøen, Norway. 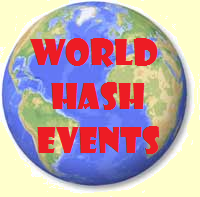 Mar 22-24 10th Hashy Birthday Hosted by the Louisville H3 in Louisville, KY, USA. Mar 23-30 Hash Caribbean Cruise Hosted by the Moons Over Barbados H3 sailing from Martinique. Mar 29-31 Anything But Human Hosted by the Every Day is Wednesday H3 in Ocean City, MD, USA.